Every October, children and adults around Lakeland 55+ communities are really excited for Halloween. 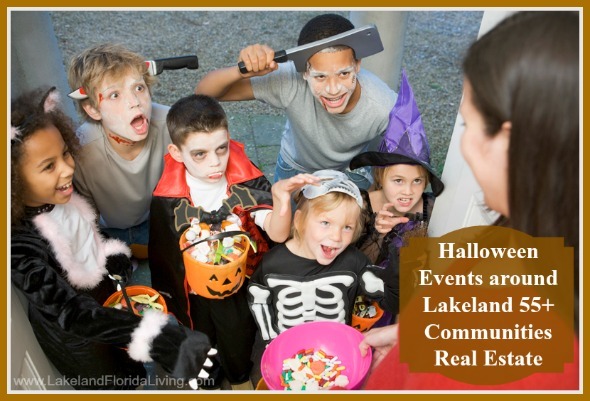 Aside from the traditional Trick or Treat, residents of Lakeland can also enjoy a number of events during this time of the year. On October 28 from 10am to 1pm, the Children’s Museum will hold an exciting hands-on program for the entire family. Participants are invited to wear their best costumes to the “Boo! Bash,” with choices ranging from comic book characters tp fairy tale or storybook characters. Plenty of games and entertainment are in store for guests. Prizes will be given away as well as snacks. It’s a Halloween event that the entire family would definitely love. Who says Halloween is only about Trick or Treat? At the “Boo! Bash,” children and adults can join a variety of activities and have a great time together. Happening every Friday through Sunday until Nov. 25. Admission: $10 ages 11 and older, $8 ages 5 to 10, ages 4 and younger are free. Please call 863-859-6472 for more information. Location: 13444 Moore Road, Lakeland Fl.